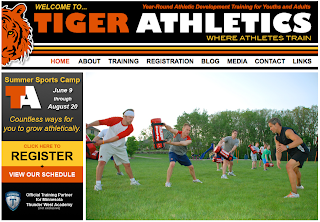 The new website I designed for TIGER ATHLETICS is finally up and running. You might remember the business cards and logo I designed for them a few months ago. Stop by and have a look. Next up: The TIGER blog and sister site IGNITE ATHLETICS. This looks great! I was wondering if you coded this site too?